At 1830mm high with spacious, versatile internal shelving, our double door cupboards give you all the room you need to store those larger office items. 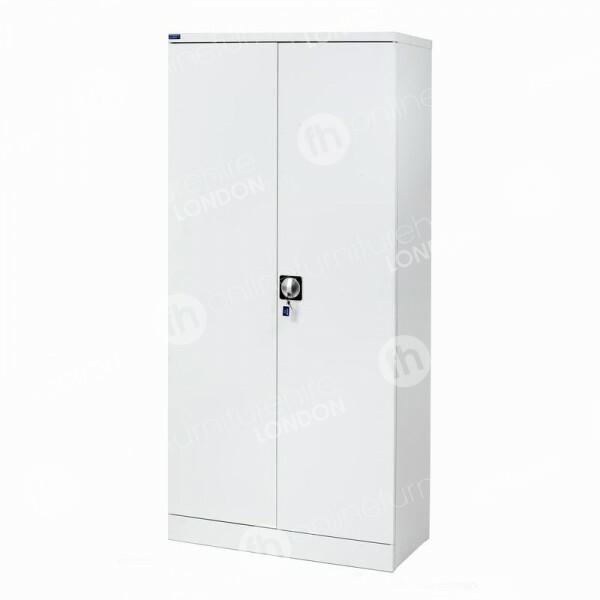 Lockable and secure, our cupboards also offer a location to store valuables, while the grey metal finish is chic and modern - a fantastic choice for all your offices, receptions and meeting rooms. Times Change... So Does Cupboard Hire! Buying a cupboard many years ago would mean purchasing furniture that looked more like today’s bookcases. As well as serving as a place to store items to keep properties clutter-free, older cupboards gave us a cleaner location to keep goods. It's an entirely different sotry today though, thanks to our cupboard hire range. In the 1300s the design of cupboards began to evolve and by the 1500s they were a bit more recognisable as they more often featured doors, allowing homeowners to store food where dust and dirt was far less likely to gather. The style of cupboards increasingly got more diverse over time, some were built into walls for example, and when WWII ended, metal stocks were freed up and featured more in furniture such as cupboards. This product line has all the resilience expected of a metal cupboard in the 21st Century. As well as being made from an exceptionally strong material, these models also have integrated door stiffeners, adding to the robustness of the item. Inner shelving provides ample room for all kinds of office items, from files, to reference books, stationery and equipment too. Cupboards may have mostly been used in domestic settings when they were first invented but their usefulness meant they eventually crossed over to be used in corporate locations too. All the things that make them a necessary item in the home, also mean they’re a must-have item in offices too. The first benefit is that they keep locations looking neat and tidy, essential for professional locations. Additionally, placing all your stationery, digital equipment or folders in one location makes them easier to find, great when you need more paper in a hurry! Another top feature of our double door cupboards, is that they lock. The first cupboards were open, and consequently there was no way of locking them anyway, but the evolution of a locking mechanism is perfect for offices. 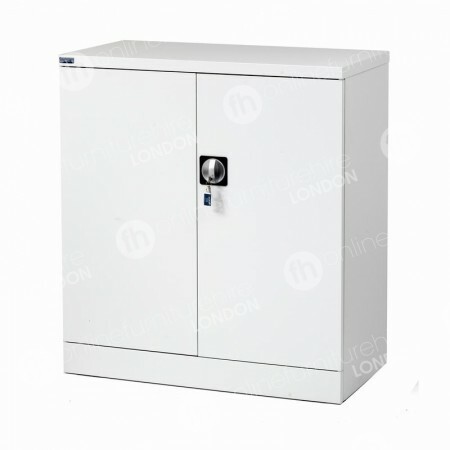 Hiring this item from us means you get storage, that’s not only spacious, but lockable too. Many premises have sensitive information that requires securing in this way, or you may simply want a safe place to store your own valuables and personal possessions. With our two heights available, measuring 1020mm and 1830mm, you can get the best fit for your premises. What’s more, we’ve chosen our entire furniture hire London range to include items that complement each other, so as well as choosing grey metal cupboards, you can also opt for our filing cabinets with the same finish and our desks in light oak, giving your location a very modern and professional look. I’d like a really modern looking cupboard - will this fit into a contemporary office? Definitely! This is has a very attractive and sleek grey metal finish that suits light, bright modern spaces. Has it got a sturdy design? Yes. We’ve made sure to have our cupboards installed with internal door stiffeners, adding to the robustness of this product.